﻿ Hotel Ramapendula, Alberobello | FROM $87 - SAVE ON AGODA! The Ramapendula is a family-friendly hotel in Alberobello, offering an outdoor swimming pool, a characteristic Apulian restaurant, and bright rooms with garden views. Parking is free. Hotel Ramapendula's rooms all come with a small balcony, and are bright and decorated with relaxing color shades. Breakfast includes coffee, cappuccino and fresh pastries. The elegant and rustic restaurant of Ramapendula Hotel serves Mediterranean cuisine with local specialties. Drinks and snacks are available in the airy and stylish bar. 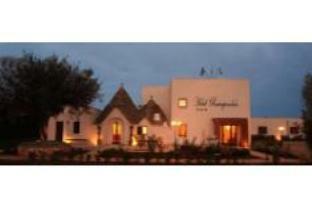 The hotel is in Contrada Popoleto, a 10-minute walk from the Trulli area. The Castellana Caves are also a short drive away. pleasent stay at very clean 3 star hotel close to world heriatage site which is stunning to see. would reccomend going to see the Trulli. We stay for a week-end, good place with clean room and a beautiful swimming pool, very close from the Alberobello center. Good quality for a small price. A lot of sightseen place in a rage of 30 km from the hotel.